Before I start thought please note: I have in no way been compensated for this review. We just love it! In fact I have level 2 sitting here at my feet just waiting for me to unbox it. We started with Miss C and Miss L at level 1 because they already knew their letters and most of the sounds of each letter. There is a Pre-Reading level that I am pretty sure my youngest would love to have to have her own letters school but at the moment that is not in the budget. We purchased the Deluxe Interactive Kit ($48.95) and then the Level 1 Materials ($99.95) and one additional student packet ($24.95). We also purchased one more box, divider cards and another sheet of stickers. So our total for two girls was $188.75 before shipping. Not too bad when you consider I will be able to use these materials all over again for Miss F when she gets to this stage and the box and dividers are things that get used for Miss C and Miss L for the entire duration of the time we will be using All About Reading. 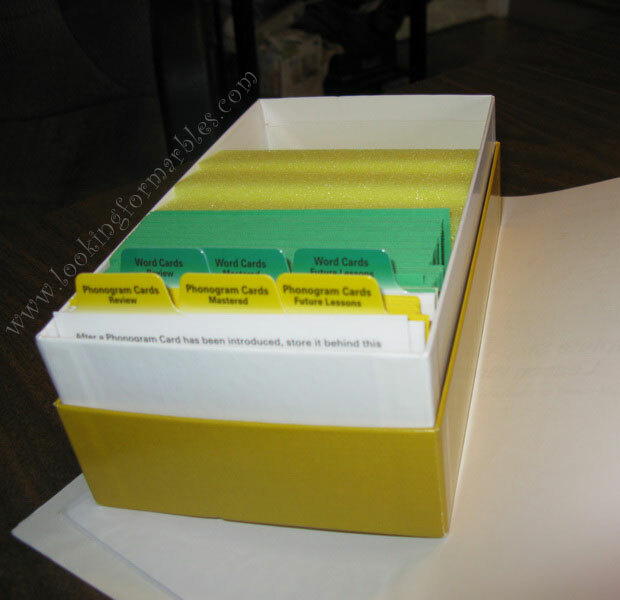 Once you get the kit, you take apart the word cards, the phonogram cards, and put the cards in the boxes (or boxes of your choice) placing all the cards behind either the Phonogram Cards Future Lessons or the Word Cards Future Lessons divider. 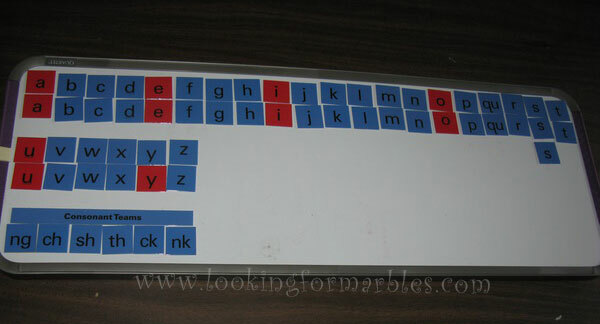 You also put your magnets on the back of the letter tiles. Ideally you have a large magnetic white board to use these on. We do not have that. So we have this one and have modified the spacings a bit on the board. I can see that as we pull out All About Spelling 1 and All About Reading 2 I will need to have the bigger space but for now this is what we have. Looking through each lesson the teachers manual will tell you what cards you need, so you can pull them out. On the bottom of each card there is the number of the lesson that it is associated with, which helps tremendously as you mix them up while the child is working through their lessons. There are only a few you have to go back and find for later lessons but that lesson and card number make it much easier to find them when you need them. So for example for lesson one you need to have Phonogram cards 1-4, Word Cards 1-3, Blast Off to Reading page 7 (the student activity book) and the progress chart. As long as I had the activity sheets ready to go, the program really was a pull it off the shelf and go type of program which works very well in our homeschool. The Fluency sheets you choose what the students read for practice so you can do as much or as little as you like. I have one child who really took to reading so she can read a lot of the sheet without any trouble. The other child struggles a bit so we don’t push it as far with her, give her a taste of the fluency sheets and if the day is going well we might read a bit more off of them. Otherwise we might put them away and pull them out another day for some additional practice. The girls loved to do reading time. It is not in any way a chore like math has been at points. I have watched the girls blossom with their reading skills and now will hear Miss L say, “I can read that!” We are still working on Miss C’s confidence in what she believes she can read. She does not like to be wrong, so she would rather not chance it than to be wrong. But we are getting there. She is finding that she can read more than she thinks she can. It is step by step. I love how everything is broken down it makes so much more sense to me than phonics ever did when I was trying to teach it in school. I was of the generation (in my school) that was not taught phonics. 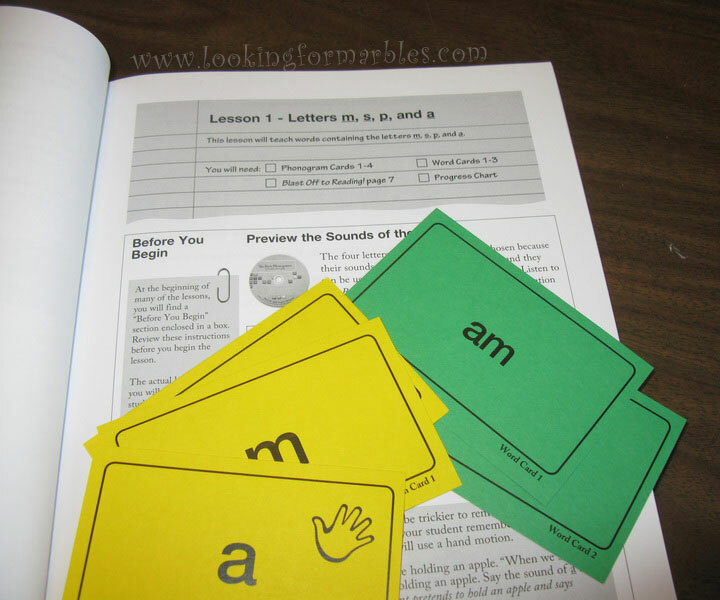 So when I went for my Elementary Education degree and had to learn phonics to try and teach them, ugh! It was so hard! This makes so much more sense. I’m learning some things I never knew about before (open or closed syllables anyone?) If I’m trying to remember a sound that the letter makes to isolate it for the girls there is a word on the back of the phonogram card that helps me do that. So I can say the word in my head and then say the correct sound for the girls to hear. Because you keep reviewing words or phonograms you don’t feel stuck at a lesson and unable to go on. You do go on. Those words or phonograms that are causing some difficulty just keep getting reviewed over and over and when your child finally gets it, the light that radiates from their face is awesome. 🙂 I remember being in the lowest reading group as a kid, I never wanted my girls to have that feeling as they are learning to read. If I have had question all I have had to do is simply contact Marie and she helps me out. Like when Miss C was having trouble getting the correct sounds for e and i consistently. The Teaching Tips newsletter and the freebies have been great too. I’m in the process of trying to get some of those freebies out and ready to go as we are trying to implement more of a workbox setup into our homeschooling. What didn’t I care for so much? I actually found the phonogram CD-ROM a bit hard to use. No technical problems with the computer. Just the fact that if a letter has multiple sounds, the phonogram CD just tells them all to you at once when you select that letter and it felt in quite quick succession. I would have preferred to be able to hear each individual sound in isolation by lesson. For example in lesson 1 when you introduce the phonogram of a, there are eventually three sounds for it. But you only introduce one sound in lesson 1. The other two sounds get introduced in lesson 44. I would have loved to have had the isolated sound for the a in lesson 1 so I could play it for the girls if they were disagreeing with on the sound it makes. Yes really that is the only “negative” that I find to the entire program. 🙂 Well unless I’ve gotten behind on getting activity sheets ready and then realize I’m not ready for the lesson we are trying to do that day. But I’m getting better at that, that is not a reflection on the program just my poor planning sometimes. Would I recommend this to anyone else? – Absolutely YES! In fact some on Facebook very well might think I get a kickback from the company for the number of times I mention it on posts when someone is looking for a program (I do not). If you have any questions on AAR1 and want to ask me, please feel free to comment below and I’ll try to answer the best I can.